Early on we had the idea to work with a group of DIY biologists (citizen scientists in molecular biology). We quickly found a group of Biohackers based in the London Hackspace, and so we initiated contact at the end of May. Our original concept was to work with the group on an add-on component to our own project. We quickly got excited about the possibility of doing this over a one week workshop in an art gallery, where we would build a temporary laboratory visible from the street. To take this further, we successfully applied for UCL's Beacon Bursary. Working on the application led us to consider our target group and evaluation much more carefully. It was clear that the most important target group was the handful of Biohackers themselves. Due to this and due to the great complexity, cost and difficulty in regulations, we decided to progress from the gallery lab concept and instead split the work into two workshops - one in the Hackspace and one at UCL. To reach a wider public audience, we instead choose to host an exhibition reflecting on the collaboration. It became clear to us that we needed to have a definable "product" as an output of our workshop to focus our efforts. After weeks of initial conversations and a thorough safety workshop, our groups converged on the idea of creating a new BioBrick from scratch, using one of our marine bacteria as a source. We became intrigued by the idea of a new BioBrick, completely chosen, designed and created by a public, non-academic group. After emailing Meagan Lizaro from iGEM HQ, we realized that this was actually going to be the first "Public BioBrick". This seemed to us a great symbol for the question of accessibility which we quickly encountered when we first met the Biohackers, ie. "Who should have access to the tools of Synthetic Biology and the Registry of Parts?". Haklay, M. (2013). 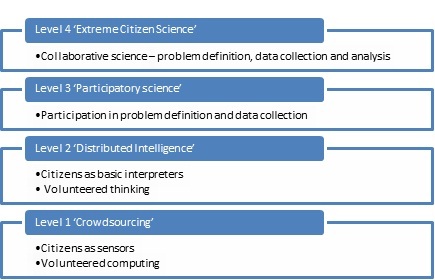 Citizen Science and volunteered geographic information: Overview and typology of participation. In: Crowdsourcing Geographic Knowledge: Volunteered Geographic Information (VGI) in theory and practice. Sui, D., Elwood, S., and Goodchild, M. (Eds.). Dordrecht: Springer Science.